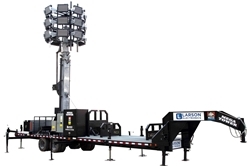 Industrial light towers and portable masts are often deployed in rugged, outdoor work sites. Such locations experience a range of unpredictable and destructive elements, including corrosive or acidic rain, rough contact during setup or tear down and strong, crippling winds. The last factor is a major concern for exceptionally tall light towers and deployment in urban locations with high activity. In addition to knocking a tower over, gusting winds can bend or compromise the stable nature of the mast. Because of significant safety risks associated with strong winds, it is important to calculate wind load for industrial light towers. Wind load is a widely used term to refer to elements of external pressures, forces or densities that are exerted by a gust of wind onto a structure. Like equipment loading, the presence of strong winds create stress on the surface of the tower, causing it to vibrate, shake, crack or topple over. This phenomenon arises when dynamic energy from wind is converted to pressure, as it encounters an obstruction – which in this case is the surface of the light tower. Force is produced when wind exerts pressure on a surface. In the formula, A represents the projected area of the structure, while P refers to wind pressure. Cd represents drag coefficient. Starting with the projected area (A), the first step is to find the area of the surface exposed to strong winds. Note that for a thorough approach, each side of the tower must be calculated. Furthermore, the shape of the mast may dictate the specific formula to apply in finding A. In the American Society of Civil Engineers code formula, V represents wind speed (mph). Moving on to the next component in the formula, Cd values may vary, depending on the shape of the surface being measured. For instance, a long cylindrical tube features a standard drag coefficient value of 1.2; while the standard drag coefficient of a flat plate is 2. Sample Application: Determine the wind load for a 6-foot light mast with a diameter of three inches, exposed to 50 mph winds. Note that the above formula is just one of many ways to compute for wind loads. Companies may apply or omit certain variables, depending on the type of mast, type of equipment and outdoor conditions. In this formula, Kz refers to exposure coefficient and Gh refers to gust response factor. Larson Electronics is a leading manufacturer of industrial lighting and power distribution equipment. For more information about out light towers, head over to the website.